A $40 Regimen Lasting More Than 6 Months? It Can Be Done. Living in Texas means withstanding excruciating hot summers and experiencing non-existent winters. Taking an outdoor yoga class or kayaking on the lake in the summertime can leave your hair parched. Excessively dry, brittle hair is a real concern in regions with scorching, unrelenting sun rays. Lately I have noticed that there are four products all under $12 that I consistently revisit twice a week and have been lasting for six months now. This means that I can spend less than $100 a year on hair products, which is a win, especially for afro-textured hair. Here are four products that do not require generous applications to work, thus saving you money. Many textured-haired women are still undecided about using shampoo, which one, and how often. The SheaMoisture Jamaican Black Castor Oil Shampoo (JBCO) is the only cleanser that thoroughly cleanses my hair and scalp without leaving it excessively dry. Since it lathers very well I do not have to apply a generous amount. I hold my ends taut, apply about a quarter sized amount to each quadrant of my scalp, scrub with my fingers, and smooth the lather down the length of my hair to encourage shine. With this shampoo my hair does not shrink and matt, so I do not have to detangle beforehand. The JBCO shampoo is so thorough yet gentle that I use it twice a week with no issues. After cleansing I faithfully deep condition my hair to restore the moisture that the shampoo depleted from my strands. Like my shampoo I do not have to apply generous amounts of the SheaMoisture Superfruit Complex 10-in-1 Renewal System Hair Masque because the slip helps it spread easily. I receive the most moisture when I cover my hair in a plastic processing cap and sit under a hooded dryer for 15-20 min. I always tell people that the determinant of whether a deep conditioner works is how your hair feels after you rinse it off. I have used products full of slip and leave my hair with no moisture. Don’t be fooled ladies! Granted it is nice to expedite the detangling process, remember the purpose of deep conditioning is to impart moisture. Your hair should feel soft and moisturized after rinsing your deep conditioner or masque. This article was not sponsored by SheaMoisture. 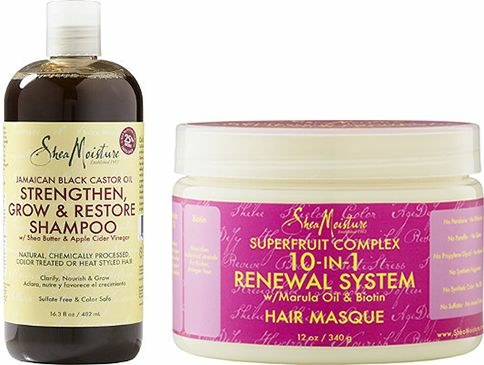 The SheaMoisture Jamaican Black Castor Oil Leave-in Conditioner is one of my favorite leave-in conditioners. It maintains the moisture after my deep conditioning session while strengthening my hair as well. A few of the moisturizing and strengthening ingredients include hydrolyzed keratin, hydrolyzed rice protein, castor seed oil, and aloe barbadensis leaf juice. My hair is always left soft and not hard like most products with proteins. The Eden BodyWorks All Natural Curl Defining Creme is hands down the best styling crème I have ever used. It is neither as thick as a gel nor as thin as a pudding or a soufflé, so maybe calling it a crème gel is the most accurate way to describe its consistency. There are three uncompromising reasons why I love this styler: slip, definition, and hold. Regardless of how well a styler will enhance my curls, I will not reuse the product if it does not contain slip. A styler without slip will cause tangles and breakage. When I shingle this product through my hair it glides effortlessly without friction. The next factor is definition. Without definition the styler did not serve its purpose, period. Hold is determined by the longevity of my style. If I can wear a wash and go for 4-7 days without much frizz, then the styler is worth repurchasing. With Type 4 textures being prone to looking and feeling drier than looser textures, this styler adds shine to my hair while sealing in moisture with the coconut oil, jojoba seed oil, and avocado oil. This is my go-to regimen for maintaining a clean scalp and a moisturized, defined, wash and go with 4a hair. How do you maintain moisture in the summertime?